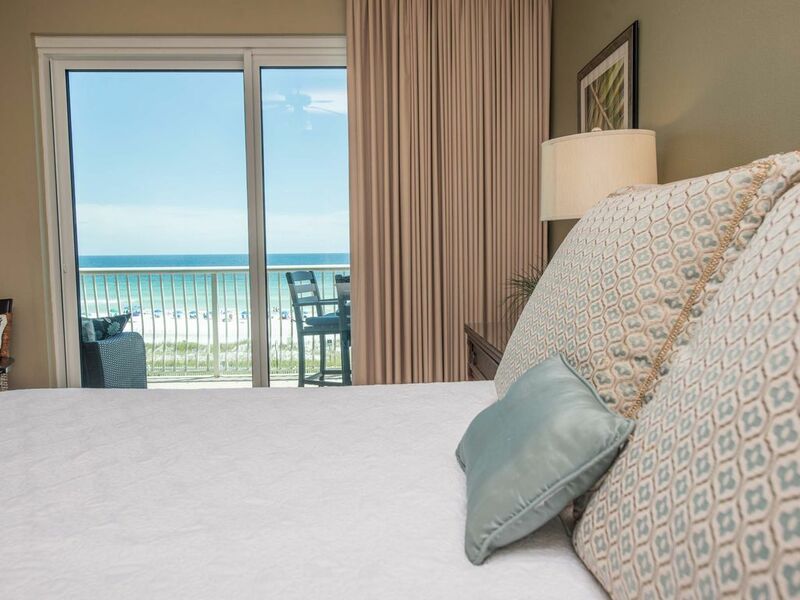 Beach Retreat 306 is an updated 3 bedroom/2 bath condo sleeps 8 at Beach Retreat. Large balcony and comfortable furnishings. We are a mother/daughter business here in Destin. While we own and operate several of our own condos at Beach Retreat we take care of this unit for a friend of ours. Everyone loves Beach Retreat! Especially a Beach Retreat Condo that has been fully updated. This condo is a must see! Very clean, dog friendly, nice decorating, kitchen very stocked with pots and pans etc. Outstanding terrace and view of the Gulf. Great condo! Beautifully decorated. We loved the balcony. We enjoyed our stay so much. The condo was very nice and comfortable. It was very nicely decorated. Wonderful view. The temperatures were a little cool so we sat on the balcony quite a bit. We loved it. Our grandson and dog loved it. They always wanted to sit on it, even in the rain. Great space behind the gate to take your dog for bathroom breaks. We had a great experience and can’t wait to go back again. Loved it!! Will be back!! Condo was quiet, roomy, clean and well stocked. Laura and Renee responded quickly to questions and issues. Had a great time. Loved being able to see the gulf from the balcony and walking to restaurants. Dolphins everyday! AMAZING BEACH VIEW AND SOUNDS OF THE OCEAN WAS MUSIC TO THE EARS! This condo was absolutely amazing. There is not a place at Beach Retreat that has an unsatisfactory view. The condo was able to accomodate myself, husband, twins, and mother in law without feeling like we were on top of one another. Very spacious. Pictures do not serve it justice as all of the decor was beautiful and not cheaply decorated. LOVED the master bathroom off of the master bedroom with dual sinks and a very large shower and garden tub. The very roomy deck facing the ocean was AMAZING, and we slept with the sliders open so we could fall asleep to the sound of the ocean waves. A few suggestions.. keep the workout room open later than 8pm, as vacationers such as ourselves do not always make it back to the condo in time when sighseeing, etc. Also, a more thorough inspection of the condo would be recommended especially since I found a few things broken upon check in. Finally, more grills would be nice as a large party was present while we were there and basically camped out at the grills, not allowing others a chance to use them. But all in all, I can not wait to return next year! Beach Retreat 306 - FEELS LIKE HOME! We just arrived home from our week in Destin. Had a wonderful time ! Watching dolphin from the balcony while having breakfast was a treat! Beach Retreat 306 was a great place to stay. CLEAN, COMFORTABLE BEDS, NICELY DECORATED, FAMILY ORIENTED, CONVENIENT LOCATION! Renee is very nice to work with. She made sure everything was as expected. Will definitely stay again. Also bringing our pet was very important and he fit right in. Pet walk available. Thanks again Renee! Our pet owners appreciate the nice accommodations and nice view. Our pets enjoy the wonderful walks along Scenic Gulf Drive and being with their family on vacation. Thanks Debi. We look forward to your return.